Victorian society was defined by a strict moral code, which included strong religious values, commitment to hard work and steadfastness no matter the problem. It’s hard to imagine that anyone followed the Victorian ethos more faithfully than Joseph Darling. Joe Darling was from a religious Scottish family, with his father being a pillar of the community. Darling followed his father, becoming a successful business man and a politician. What set Joe apart from all the other Darling clan, they were a most successful family, was his cricket talent. 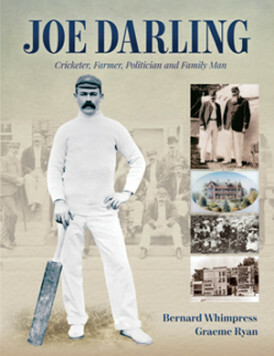 In this book the authors’ not only tell the story of Darling’s cricket career but also his business and political endeavours. Darling comes across as a no nonsense, strict disciplinarian who did not tolerate fools. Darling captained the Australian cricket team at a time of significant change in the game, as the players and the forerunner to the Australian Board of Control, fought over control of the lucrative Australian tours to England. Joe Darling, dissects the battle and shows the players in a positive light, with extracts from Darling’s writings and reminiscences. Darling also played with and against some of the greatest players from the golden age of cricket; Victor Trumper, Clem Hill, Monty Noble, W.G. Grace, Ranji and perhaps the greatest ever bowler S.F. Barnes. We meet all these legendary figures, and the authors do not appear to have missed any of the anecdotes that have been handed down over time. Trumper was Darling’s personal favourite and he rated him the greatest batsman he saw. Darling’s admiration for Trumper’s skill shines through in the book. In a coincidence, Darling’s career coincided with one of two of the greatest lefthanders to play for Australia, the other being Clem Hill. Both were schoolboy champions at Prince Alfred College and went on their first tour of England together in 1896. Darling just piped Hill to become the first lefthander to score a Test century. In the end the authors suggest Hill was the more successful batsmen but there was one cricket area where Darling remained Hill’s superior, and that was in captaincy. Darling, captained Australia on three tours from 1899 to 1905, and proved himself one of the best Test captains. His 1902 team is still considered one of the greatest of all Australian teams, and until the 2005 Ashes the contest in 1902 was the undisputed best series in Anglo Australian history. The book also features copious illustrations, which help to take the reader back to the turn of the 20th century. There are insights into what it was like to travel to England by steamship and the onerous itinerary the players subjected themselves to in order to post the greatest profit. As the players shared in all the revenue made, the more games they played the more they earned. Joe Darling, lived a full life, not just in a cricketing sense, and his story is a fascinating one. Thankfully it is told thoroughly and entertainingly by Whimpress and Ryan. Add to this some great production values and this is a great read. It should be in the book collection of all cricket fans. Thanks Archie and I liked your comment about Joe ‘piping’ Clem. I guess he had to as a Scotsman!